The flames are licking at our toenails. The 600 scientists of the Intergovernmental Panel on Climate Change have warned us to expect a temperature increase of between 1.8 °C and 4 °C by the year 2100. This will make sea levels rise by up to 60 cm, the experts think, with a likely increase in the frequency of droughts, extreme tides and the intensity of hurricanes. As minuscule cogs in a gargantuan engine, it is hard to hold individuals to account for these alarming consequences. How many of you in the UK really care if you each emit about 2.6 tonnes of carbon in the form of carbon dioxide (CO2) per year? It is not as if someone is going to dump it as a great heap of coal on your doorstep. But what rise in the atmospheric temperature do we in fact cause individually? For someone living in the UK, or, in my case, Japan, a rough calculation based on a knowledge of current emission rates gives a rise of one nanokelvin (10–9 K) over an 80-year lifespan. Such tiny temperature changes are more generally associated with fields of research such as Bose–Einstein condensation or the cosmic background radiation. However, do not be fooled — this temperature rise of 1 nK that we each produce is not as small as you might think. If I express my 1 nK as a fraction of the absolute temperature of the Earth’s atmosphere (about 300 K), it equates to 3 × 10–12. If I express my body mass as a fraction of the mass of the atmosphere, it comes to 1.5 × 10–17. The ratio of these two fractions is 200 000 to 1. So, in a manner of speaking, over my lifetime I am punching at 200 000 times my own weight. This amplification factor is not so surprising given that I will emit about 750 tonnes of CO2 during my lifetime as estimated from current emission rates — a figure that already corresponds to 10 000 times my body mass. As an aside, this 750 tonnes comprises about 1031 individual CO2 molecules — laid side by side in a single layer, they would cover an area the size of England. Free in the atmosphere, the CO2 will have ample time to trap outgoing infrared radiation, producing a cumulative effect. Remember also that this is calculated only for an 80-year period, and things will in fact be even worse because CO2 lingers in the atmosphere for up to 200 years. What then are we to do about global warming? In his film An Inconvenient Truth, former US vice-president Al Gore suggests that we should all join local action groups and make individual lifestyle changes. Meanwhile, the book Heat by Guardian columnist George Monbiot offers a vast array of doable, innovative solutions involving government intervention, such as replacing cars by coaches. As a small step in the right direction, I suggest that we should find ways of making everyone aware of every femtokelvin (10–15 K) increase that we produce. Just as nicotine content is labelled on cigarette packets and fat content is labelled on foodstuffs, it seems natural to extend this principle to the Earth itself with “Earth health warnings” incorporating a “femtokelvin (fK) count”. One way to do this would be to use flame logos (see my illustration above). The daily contribution to global temperature rise from a UK citizen amounts to about 30 fK. 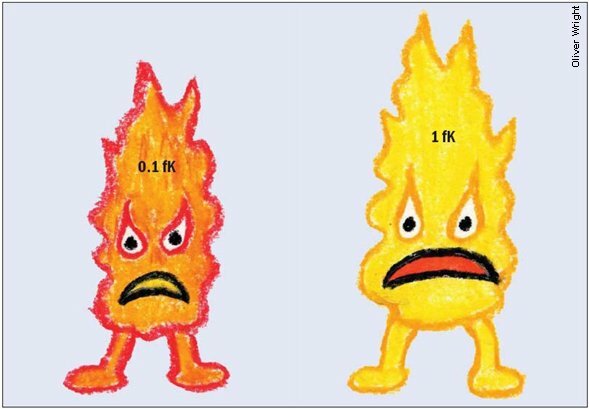 I therefore propose a yellow flame logo to represent 1 fK and a smaller, orange logo for 0.1 fK. The goods that we buy would come labelled with these logos according to their net impact on global temperature rise over a human lifetime, factoring in all the resources involved in manufacture, packaging, transportation and recycling. This would be a significant extension of the concept of labelling new cars for their CO2 emissions that is currently being implemented in California. Even an Al Gore organic cotton T-shirt would not be exempt. Of course, the telltale flames would also appear on our electricity and gas bills, and show up on petrol pumps to remind us of the damage done by each litre of fuel we buy. If I had my way, not only cars but also new houses and plane tickets would be targeted by the scheme. Admittedly it might sometimes prove counterproductive: one could imagine some people becoming addicted to the little yellow flames. Hopefully, however, this simple scheme could trigger a new awareness of our responsibility to make the best possible ecological choices for the planet. If we act now, we may get away with just singed feet.